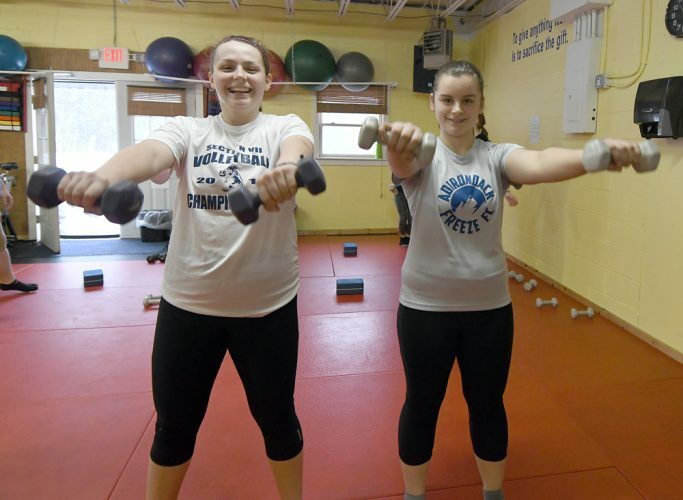 SARANAC LAKE — With Saranac Lake hosting the World Snowshoe Championships in their own back yard on Saturday, plenty of area athletes decided to give the event a try while seeing how they stack up against some of the best racers on the planet. Some of the locals have never raced on snowshoes before, while others, including Paul Smith’s College student-athlete Joseph St. Cyr, are quite proficient in the sport. St. Cyr, who was a member of a strong contingent of Bobcats snowshoe racers, turned in the top showing among snowshoers from the area, placing 18th overall on a course that featured all kinds of conditions on a warm day. St. Cyr came in looking to better his world championship performance from a year ago when he traveled to Italy with Paul Smith’s teammates and placed 20th in the field. This time around, he bettered his performance by two places and was thrilled to be competing in his neck of the woods. St. Cyr finished the two-loop, 8-kilometer course in 33 minutes, 58.05 seconds, which was a little more than five minutes off the overall winning time turned in by Colorado’s Joseph Gray. “It was a tough race overall. 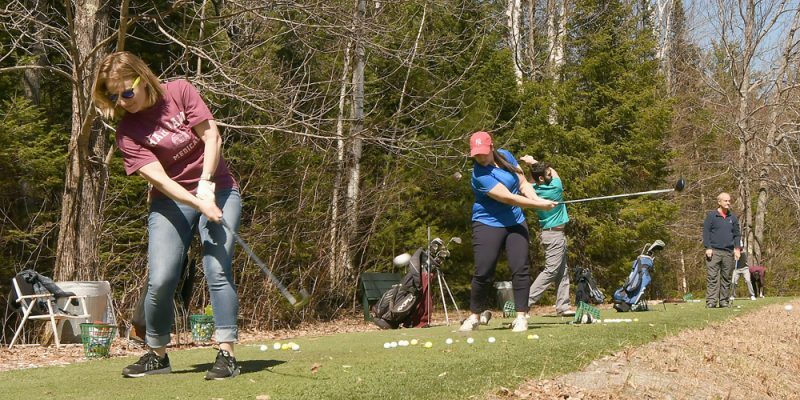 The course conditions, for what they were, were pretty intense,” St. Cyr said. “It was a river up top. It almost felt like a Tough Mudder. On the first lap, everything seemed fine, especially up toward the front — nice compact snow. 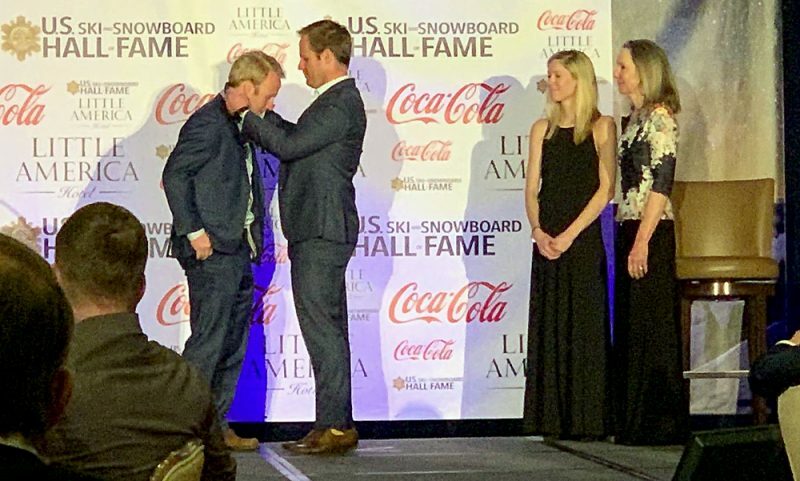 Comparing his World Championship adventure a year ago to Saturday’s race in Saranac Lake, St. Cyr said it was exciting to be competing close to home. 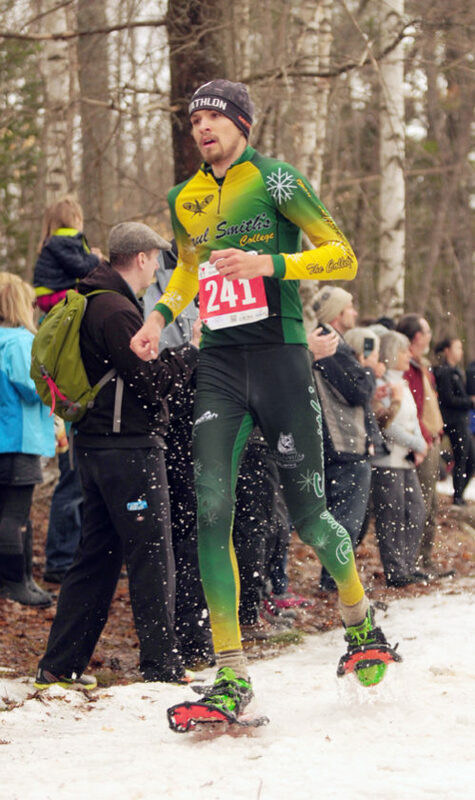 An avid runner who has competed in numerous races in the area including the Lake Placid half marathon, Saranac Lake’s Daniel Edelstein said he absolutely had to enter Saturday’s event, even though he had never been in a snowshoe race before. As it turned out, Edelstein raced to a silver medal in the 60-69 age group, finishing the 8K course in 41:32.77, a result which also landed him in 79th-place overall in the field of 266 athletes who finished the race. “This was my first snowshoe race and I live a block and a half away so I had to enter this thing, and I brought a medal home for Saranac Lake,” Edelstein exclaimed. “It’s not like I’m new to running, and I do snowshoeing all the time on Dewey, but racing on them was a first, and I really trained for this. But the thing is, I trained for the vertical and then they changed the course because of the melt. 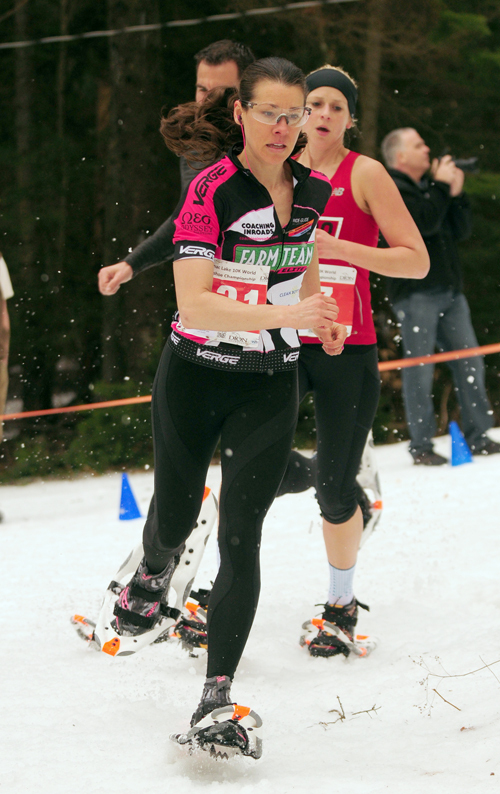 Lake Placid triathlete Rosanne Van Dorn also jumped in on the action Saturday. She finished fifth out of 27 racers in the women’s 40-49 age group with a time of 43:16.14. 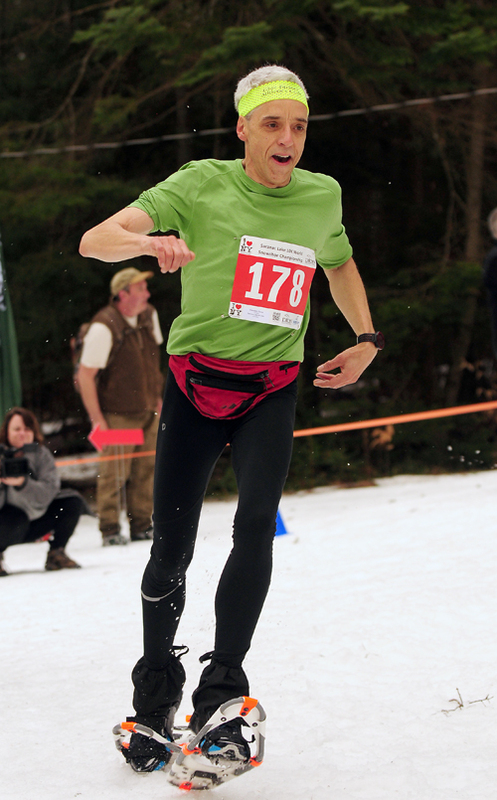 Jay Niederbuhl of Bloomingdale, a long-time runner who also participates in triathlon, just recently got involved in racing on snowshoes. He was satisfied finishing in the middle of the pack in the 30-39 age group while placing 44th overall with a 38:12.33 resul. He finished one spot behind another local racer, Sarah Keyes of Saranac Lake. 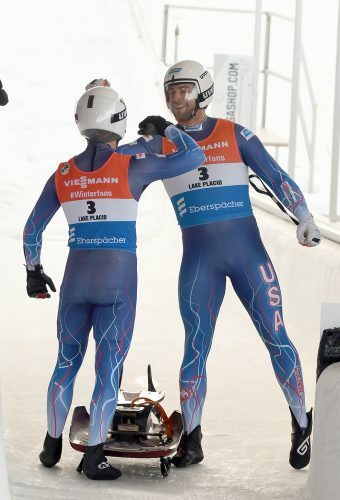 Niederbuhl said Saturday was the first time he had ever run on the course set up at Dewey Mountain, and commented that the day couldn’t have gone any better. “It was awesome. It was a very exciting, great event,” he said. “I started running on snowshoes this year and this was my first time on the trail. It was the easiest trail course I’ve ever been on to follow. I never had to second guess where I was once, and that’s the first time I’ve ever had that happen, so I could just concentrate on running. It was very well set up. I knew they’d pull this off no matter what.